Scientists in the United Kingdom say it may be possible one day to create human babies without the need for an egg. Researchers at the University of Bath have developed a technique that could allow sperm to be fused with any cell in the human body to create a baby. Until now, biologists believed that only the unique genetic combination of a sperm and an egg could prompt the development of a viable embryo. When a sperm and an egg join, the egg makes changes to the sperm which ensures that only half the sperm’s genetic code is carried over. This results in half our DNA coming from our mothers and half from our fathers. The new technique raises the possibility that two men could create a baby that carried only their DNA. Researchers at the University of Bath have created healthy mice by ‘tricking’ eggs into the first stages of fertilization with a dose of chemicals. This type of embryo normally dies in a matter of days because they don’t carry the full genetic programming to create a baby. But when the researchers injected the non-viable embryos with sperm, they transformed into fully functioning embryos. The resulting mice grew into healthy adults capable of producing their own offspring. The creation of the mice in the experiment did begin with an egg. But Dr Tony Perry, the lead scientist on the project, believes any human cell could be used to develop a viable embryo. “This is first time that full-term development has been achieved by injecting sperm into embryos,” he said. “It has been thought that only an egg cell was capable of reprogramming sperm to allow embryonic development to take place. 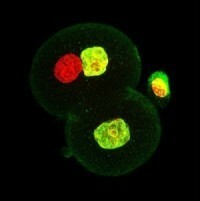 This image shows a two-cell embryo created using the new method. The green cells contain only maternal DNA, the red cell also contains DNA from sperm. This cell can replicate and develop to make offspring. Are we getting close to genetically modifying human embryos? In addition to allowing gay male couples to create babies with only their DNA, the new technique could be used to restore fertility in women whose eggs have been destroyed by cancer treatment. Another potential future application would be to breed endangered animals more effectively without invasive surgery to harvest eggs. The team at Bath say the prospect of a human created without a female egg is still a long way off. 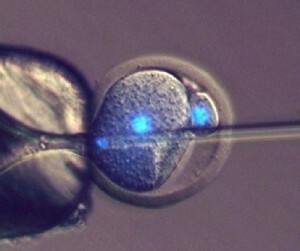 The technique would need to be approved by medical and ethical authorities before being used to attempt to make the first baby without a genetic mother. Dr Paul Colville-Nash, from the Medical Research Council (MRC) which funded the work, said: “This is an exciting piece of research, which may help us to understand more about how human life begins and what controls the viability of embryos, mechanisms which may be important in fertility.